Hanuman, is considered as Chiranjeevi (the eternal one}. He is strong, full of valor, with various skills and powers. At the same time. he is wise, a great gnami,a yogi a brahmachari. He had only one thought in mind – that of serving his Lord Ravana utmost humility and devotion. 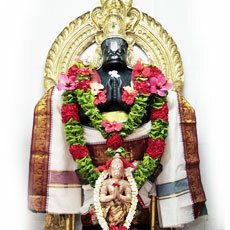 He is known as Siriya Thinivadi.He is considered to be an ansam or aspect of Lord Siva. He is worshipped in the temples as Bhaktha Hanuman or Veera Hanuman. He is seen seated humbly in front of Rama at the Rama sanctums or in the paintings theft. As Bhaktha Hanuman he is seen holding both hands together in prayer. He is seen as Veera Parratham (he brought die mount which contained the curative medicinal herbs as he could not identify them. Devotees who pray to him are blessed with courage, valour and wisdom. He is very happy when he hears the name of Rama being chanted. Hence repeating the name Rama Namam is the best way to get his blessings. His Life Hanuman or Anjaneya is the son of Anjana Devi. She was once a celestial maden and was born as a monkey – women as a result of a curse. She was living happily with her husband kesari. When king Dhasharatha performed a yagna praying for off-springs, he was yielding a pot of payasam(pudding) from the yaga fire. His wives shared the prasada and thus Rama, Lakshmana, Bharata and Shatruguna were born. A portion of his payasam was carried by the Lord of winds – Vayu Deva and fell in the hands of Anjana Devi and she gave birth to a lovely and strong son. Since Vayu Deva was responsible for the payasam reaching Anjana, he is also considered the father of Hanuman(Vayu Puthran Hanuman). He grew up as a strong and mischievous young lad. He could travel as fast as the wind. He mistook the glowing sun to be a fruit and flew upto the sky and reached for the sun. Such was his might and will power even as a child. Lord Indra was upset and struck Anjaneya with his thunderbolt (Vajraayudham). Vaayu Deva was upset that his son was struck and he stopped blowing the wind. All the Gods offered various powerful boons to Anjaneya, thus making him more powerful and invincible than before. Vayu Bhagavan was pleased and resumed his function again. Anjaneya was causing trouble to the rishis and others, not realizing the consequences of his powerful and playful actions. The angered rishis cursed him that he would cease to Raise and recognize his power unless someone reminded him of it. This calmed him down and he started his lessons with the rishis. He wanted to lean* from Surya Bhagavan who is eternally travelling. The mighty Hanuman travelled with Surya at his speed and mastered all the scriptures. As Guru dakshina Anjenya agreed to serve Sukriva, the son of Surya. He thus became a trusted and valued minister of Sugreeva, a monkey king. He played a major role in Ramayana, the great epic. When Rama was banished from his kingdom Ayodhya, he reached the forests with his wife Sita and brother Lakshmana. Sugreeva with his army and Hanuman was in hiding from his brother Vaali. Hanuman met Rama and thereafter was with Rama forever. When Sita Devi was abducted by Ravana, the demon king, Hanuman flew across the ocean and found Sita Devi in the Ashoka Vanam in Lanka. He consoled Sita Devi and set fire to Lanka, destroying many asuras. He served as the emissary of peace to Ravana's court. He assisted Rama in crossing the ocean by building the Sethu bridge along with his Vanara friends. During the war he flew to bring the Sanjeevi mountain, full of medicinal herbs to revive Lakshmana who had fallen. When the victorious Rama returned to Ayodhya and was crowned king, he continued to serve him. He featured in the other epic Mahabaratha. He stood by the Pandavas in the Kurukshetra war. He stabilised and protected Arjuna's chariot by being present in the flag flying in the chariot. He was thus honoured with witnessing the Geetopadhesam firsthand. Worship & offerings Anjaneyar is worshipped with offerings of butter and Vadaimalai (a garland of vadais). Butter is applied to the mouth and tail of Hanuman vigrahams in temples.